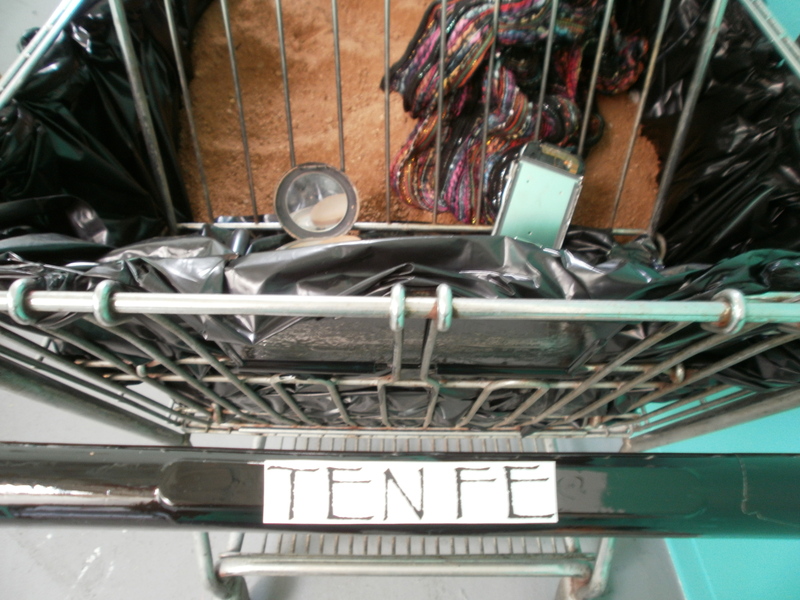 “Ten Fe” installation for TIANGUIS exhibit by Ana Guajardo featuruing Fe clothing and other vendors & artisans. “Ten Fe” is an installation offering clothing as a creative educational, empowering, and transformative vehicle to shed light on women’s experiences across the world. My clothing line created along with my partner, Joel ‘RageOne’ Garcia was created to allow women see their bodies as sacred altars and as an alterNative to the mainstream, non-worker focused garment industry. The designs carry a Xicana Indigena poltiic and spiritual sensibility and are inspired by traditional indigenous Mexican weavings and clothing. 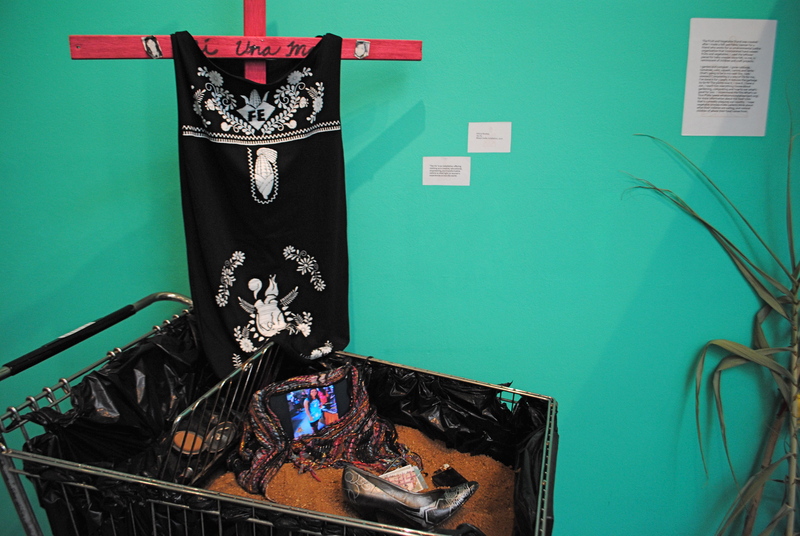 The installation features the original Fe dress design on a pink cross in the desert sand. The pink cross is a symbol used by those drawing attention to the Juarez femicides and to honor the murdered women of Juarez, Mexico. 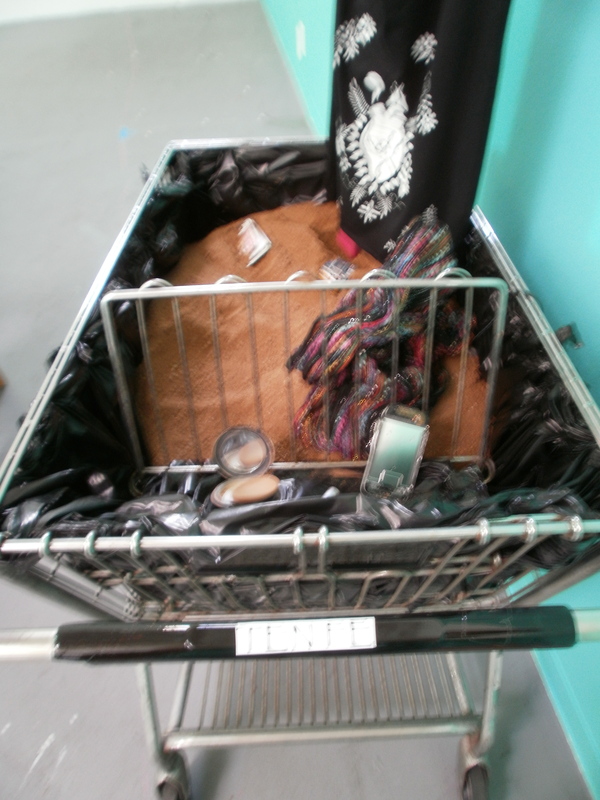 The installation is cradled in a shopping cart lined with black plastic trash bags reminiscent of body bags and speaking to the discarding of women’s rights and importance in these death cases. Laying on the sand are small tech gadgets and parts made my the women maquiladora workers who are the focus of the Juarez femicides as well as a one high heel shoe. 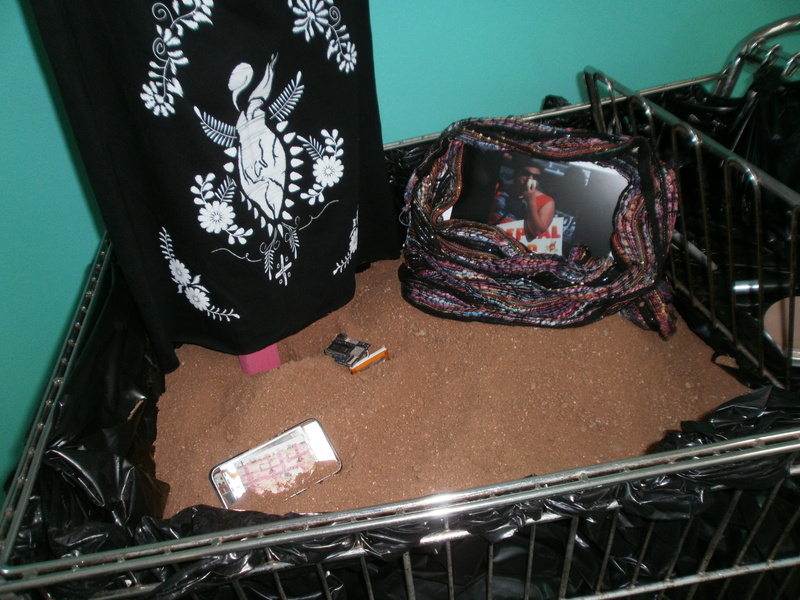 Also laying in the sand are various MAC make up containers bringing light to the scandal in 2010 of MAC’s collaboration with Rodarte make up who were to use names connected to Juarez towns and had dead-looking models and color schemes for their new look. The video featured in the in piece displays women of different walks of life in Fe dresses sharing their life’s passion, vision and work from everything from yoga to motherhood, organizing, art, etc. The juxtaposition of these themes and images are meant to have the viewer contemplate the root, means, and ends to choices of everyday life and to become conscious consumers.